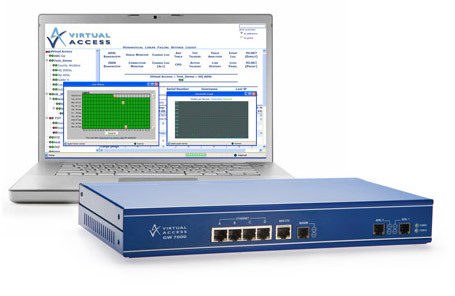 The VA integral V.90 modem can be used to dial out to access the internet, answer dial in connections, provide backup to a primary connection, and out of band diagnostics to resolve support issues quickly. The Virtual Access GW6600 and GW7600 routers provide an internal PSTN dial modem option offering ‘out of the box’ automated router configuration and out-of-band router access for managed service applications. Deployed routers can be configured to allow dial in connection from a central modem pool or to dial out on demand. For diagnostics, support teams can access a router over a browser and command line allowing for real time debug and diagnostics. Caller ID can be configured to add security to the connection.